If you’ve ever walked through a soybean field during bloom you may have noticed a number of different insects visiting the flowers. This is because soybean provides a valuable habitat for many pollinators, including bees. There is evidence that foraging bees can enhance yield even though soybeans are self-pollinating. Despite their regular presence in the soybean fields, a number of questions remain unanswered, such as what species are present in the field and how far into the field are the bees foraging? 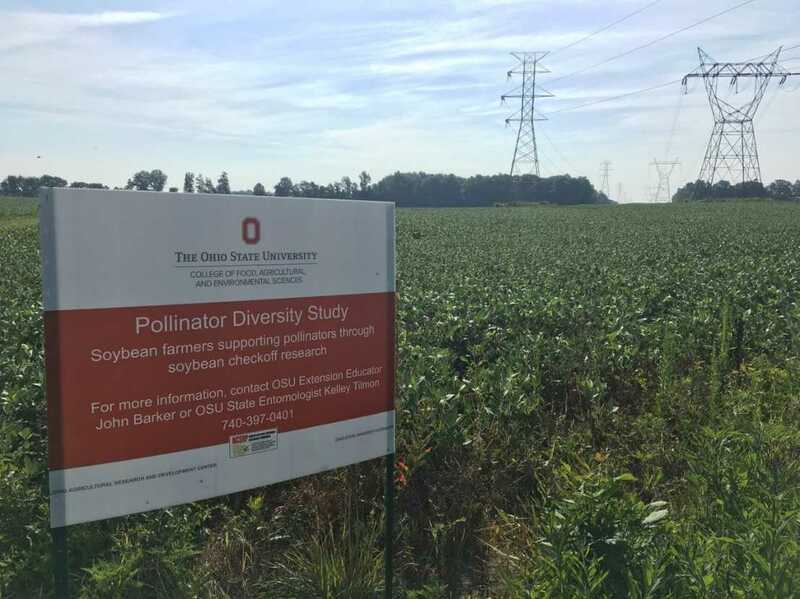 To answer these questions, a study was conducted in eight soybean fields located in seven Ohio counties, monitoring soybean fields for pollinators during bloom. These counties were Ashtabula (2 fields), Darke, Fulton, Knox, Licking, Logan, and Pickaway. Results from the survey found that Ohio soybean is a habitat for an extensive diversity of bees, including 49 species from five families. The five families included Andrenidae (e.g., mining bees), Apidae (e.g., honey bees, bumble bees and longhorn bees), Colletidae (e.g., plasterer bees), Halictidae (e.g., sweat bees) and Megachilidae (e.g., leaf cutter bees). Overall, sweat bees were the most prevalent family, comprising 96% of the bees captured. Ohio’s most widespread and common bee species in this survey was Lasioglossum hitchensi, which comprised 36% of all of the bees captured. L. hitchensi is a native sweat bee that nests in the ground and was the most abundant species at the majority of field locations. In addition to the extensive diversity, bees were collected from all locations throughout the field, including midfield, as early as beginning flowering. This shows that bees forage the entire soybean field soon after soybean plants begin to bloom.